Only a few more days til Christmas!! And everyone will be here!! I can't wait!!! Tomorrow after a trip to Baton Rouge for a few last minute gifts, I'll be doing a little cooking. I'm not delusional enought to think that I can do enough advance cooking to get it all or even largely done. I know that I'll be practically living in the kitchen until everyone leaves, but my goal is to be in there leisurely cooking and not frantically trying to get things out like a short order cook. The inn at Bethlehem is once again largely a horse operation. And of course Mary and Joseph have no need for a donkey. Not when they've got their loyal Bernese Mountain Dog hauling the milk cart. ..... we've got another stocking on the mantel!!!!! Before anyone asks, no I didn't sew Kathleen's stocking! My needle and thread are retired or at least on extended sabbatical. But it was bought with love.... does that count?!!! I can't blame it on Mr. Biggs this time. Though he hogged the bed and snored and wheezed for most of the night (actually someone else was also snoring and wheezing in the bed so it was a veritable symphony), Mr. Biggs only asked to go out once last night at midnight. However, I was awake for hours. In an effort to be thoughtful, not to mention taking literally the "letting sleeping dogs lie" maxim, I didn't want to disturb the two snorers by switching on the beside lamp in order to read my book. Consequently, I spent hours last night basking in the glow of my iphone reading the BR Advocate and the New York Times and playing Solitaire and Sudoku. I enjoy the NY Times, but after an hour or so I had read my favorite sections and was left with such page turners as "Celebrations and Weddings" and "Automobiles" I could have finished Dorian Gray and instead I read about the weddings and courtships of perfect strangers and the new updates to the Ford Explorer. Save me from iphone radiation. If there are any procrastinating shoppers out there, would someone please give me a book light for Christmas! Can you believe that was 14 years ago? How is it that her master has changed so much from age 11 to 25 and yet she appears ageless? Is it all that organic food she eats??! I'm barely awake. Between 10 pm and 2 am, Mr. Biggs went out approximately 8 times. He didn't want to stay in bed and it was too cold for him to be out of it, he wanted water, he needed to pee.... he didn't know what he wanted and seemed disoriented at times. I felt a bit like I did with a new baby trying to figure out what they wanted in the middle of the night...... sleep, food, rocking, changing, burping? Try it all and hope that something works. Finally at 2 am, he decided that he was tired and he settled into his usual spot at our feet. Cradled in the down comforter and covered up with a fleece. It's a hard life. At 9:30 he was still sound asleep and seemed a bit miffed when I rousted him out of the warm covers. Asher got this little snapshot from Carol to help him decide which of the two puppies he wanted for his birthday. Its been almost 15 years since the little fellow on the left came to live with us. I suppose I can put up with some lost sleep but maybe he needs to take a vacation to visit his master in NYC? After over 2 months without hearing from our realtor --we won't count the panicked call in November needing us to fax in a signature since the listing was expiring that day-- we finally had another house showing last week. Can you say, "Surprise!"? That night was the Christmas party for the St Francisville book group and I was bringing a Shrimp Mold. It was going to be a leisurely day.... a little cooking, laundry, perhaps some yard work and some internet shopping. Ah, the best laid plans! At 9:45 am I was still in my flannel pj pants and was about halfway through making breakfast. I had splattered grease everywhere by frying sausage and the island was blanketed with the fixings for Cornmeal Pecan Waffles. Joe took the call from the realtor who wanted to do a showing in 4 hours. FOUR hours!! What happened to the 24 hour notification clause? You could hardly see concrete or bricks in the yard because of the leaves; a hard freeze days before had turned the flowers and sweet potato vines around the pool into ugly mush; tumbleweeds of German Shepherd hair were blowing everywhere in the den; the kitchen looked like an episode of hoarders was being filmed; I had to get the shrimp mold made and in the refrigerator so that it could congeal; we were hungry for the breakfast that was half made; neither of us had showered, our lone decoration was out of season.... a dead Chrysanthemum on the front porch. But hey, sure bring 'em over! I took a deep breath and decided that since I had the eggs separated and the waffle iron already on the stove, we might as well cram in some breakfast before we went into overdrive. Time to call in reinforcements! Thankfully Paige has fallen for the Tom Sawyer idea that using my central vacuum is fun. Being both a good friend and a good sport, she cheerfully agreed to come and join the insanity as we blasted around the house while Joe mowed and blew and tried to reclaim the wilderness outside. I was hoping that if the potential buyers were Jewish, they might be charmed by the lack of holiday decorations. But since we didn't even have a menorah, I went in the attic and tore into a few Rubbermaid tubs. I had just enough time to stick the front door wreath on, fill the staircase cones with the ornaments, and put a holiday tablecloth on the porch table. "They loved it".... that's the standard report from our realtor after every showing. What else is new? Though this time, they brought a western/wildfire country attitude with them and questioned why we didn't have a sprinkler system in the house! What??!!! Even after all this time on the market, it would throw me into a tailspin if I knew that I was turning over the keys of the house to someone. St Joseph can stay in his state of hibernation. A sale in March would be perfection... I think I'll be mentally ready then. I hope. Last week we hauled into Baton Rouge and rode along the levee starting out at BREC's Farr Park and heading south. Flat delta land and not much to see but since I have a fear of Bree's long white tresses being mistaken for a flash of deer tail in the woods, the levee is one of our few safe places to ride from now until February. 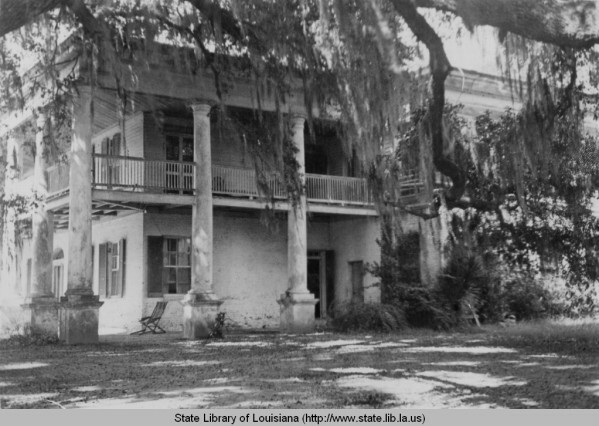 The Cottage Plantation ruins are about 3 miles down River Road (totally unrelated to the Cottage in St. Francisville). Andrew Jackson and Zachary Taylor, Jefferson Davis, Henry Clay, and the Marquis de Lafayette. 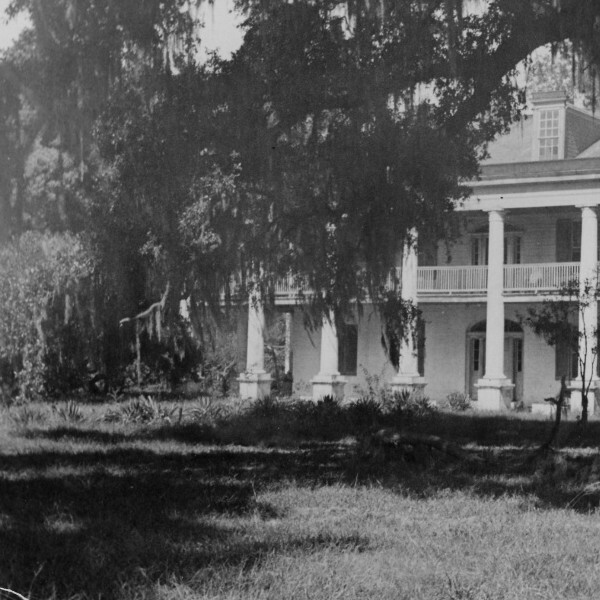 Lightning was the cause of the fire which destroyed it in 1960. Since I only remember it as ruins, I decided to do a little "googling" and enjoyed reading about the history of the grand old home. What a wedding gift! Usually we scoot down the backside at one of the breaks in the concrete reinforcements and ride along the batture (the flat land between the levee and the river) but since the weather was so fine, we stayed up top. One big ship, a few snowy egrets, and a lone jogger were our only sightings along the levee and the river. While we went into the Pastime Lounge for a pizza. .... and it fit into our new goal of going to many of the special quirky places that we'll miss after we move. 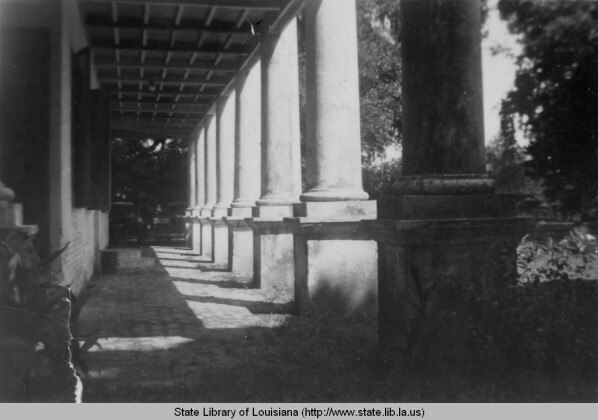 *The black and white photos of the Cottage Plantation were taken in the 1930's and are from the Louisiana Historical Photographs Collection/Digital Library Collection of the Louisiana State Library. Thanks to them for granting their permission to post them on the blog. ..... and aren't you proud of me for asking?! I'll miss the smell of grease and powdered sugar in Virginia! There's nothing like Cafe au Lait and Finger Beignets to start the day! As much as I like Lexington Coffees, their cold muffins just can't compare! After buying a variety of healthy organically grown vegetables at the Baton Rouge Farmer's Market, we headed across town to Coffee Call to satisfy our sugar, white flour and saturated fat quota for the year. In the debate over which is better, traditional square beignets or fingers, we are firmly in the "finger" camp. There is that much more fried surface area to gather up the sugar! For the last month we've been jointly working the L.A. Times crossword puzzles (in pen of course)and are finishing quicker and quicker and not needing to cheat. At least we were exercising our brains even though we were packing the calories into our bodies! Crossing To Safety.....How have I never read Wallace Stegner? One of the unfortunate effects which comes from belonging to two book groups is that due to poor time management (ie too much computer and television) I rarely read anything other books chosen for me that sometimes have a feel of being "required" reading. While in Lexington last month I was bookless, having left home with nothing but podcasts on my phone and a couple of newspapers. A dash into Lexington's Books & Co. minutes before closing time had me under the gun to find something in a hurry. I grabbed Crossing to Safety by Wallace Stegner for no reason other than it was on the particular shelf that I told myself to I had to pick something/anything from in order to make a snap decision so that the young clerk could go home! Of course Parent's Weekend being the whirlwind time that it always is, I didn't read a page. Before leaving town, I found a used copy of Midaq Alley (November's St Francisville group read) hiding in the stacks at the Bookery so I "had" to begin that on the drive home. Fate intervened when thanks to misplacing my next "free time" book to read, Wilde's Picture of Dorian Gray, I turned to Crossing to Safety last week. I'm not sorry that Dorian was hiding under the seat in the Mini! Unless lightning strikes twice in the month of December, I've just finished reading my favorite book of the year. "Floating upward through a confusion of dreams and memory, curving like a trout through the rings of previous risings, I surface. My eyes open. I am awake. Cataract sufferers must see like this when the bandages are removed after the operation, every detail as sharp as if seen for the first time, yet familiar too, known from before the time of blindness, the remembered and the seen coalescing as in a stereoscope." So what is it about? Two couples and their friendship. Ordinary people. If that sounds simple, the beauty of the book is that it IS simple. There are children, parents and other acquaintances, but they are minor planets that don't especially matter to the orbits of the "stars" in this story. There are no nail-biting cliff-hangers, violence, adultery, and no mystery to be unraveled. While there are life altering occurences in this retelling of the intertwining of their lives, the crises are met and treated by Stegner with no more attention than a normal day. Despite a lack of "drama", there wasn't a slow or boring moment in the entire book. I want to be be the fifth friend. I feel as though I know Larry and Sally and Sid and Charity. I see aspects of myself in some characters and wish that I saw more of myself in others. I've been debating whether I'd have liked this book as much when I was younger. Hopefully I would have been capable of recognizing literary greatness. But would it have spoken to me so deeply? I might have projected that in my middle-aged years I'd have an abundance of friends, achieve greatness and only die when ancient and gray. Now I'm aware of the rareness of true friends and the fact that one needn't achieve greatness or fame to matter to your family. The addition of more birthdays and the loss of my parents has meant that I no longer need a telephoto lens to see the mortality that is ever present for all of us. But being able to "identify" with a book is only one part of it's enjoyment. I don't know any Russian counts or migrant workers but even as a younger reader, I loved War and Peace and The Grapes of Wrath. Oh just go read the book! Buy yourself an early Christmas present! When I finish a few more of the books on my "To Read" stack by the lamp, I'll be looking for a copy of Stegner's Pulitzer Prize winning Angle of Repose and maybe one of his environmental non-fiction books such as Beyond the Hundredth Meridian about John Wesley Powell. I may become a Wallace Stegner groupie! I bought a paperback version and I've got my notes in it already. If there weren't so many notes and definitions scribbled in the margins to transfer, I'd be looking for a hardback to put on the bookshelves.